The main aim of the project was to support a balanced improvement of the application of the new information and communication technologies in the North Sea Region through the specification, development and validation of a set of innovative, user-centric, integrated and interactive services for better governance. 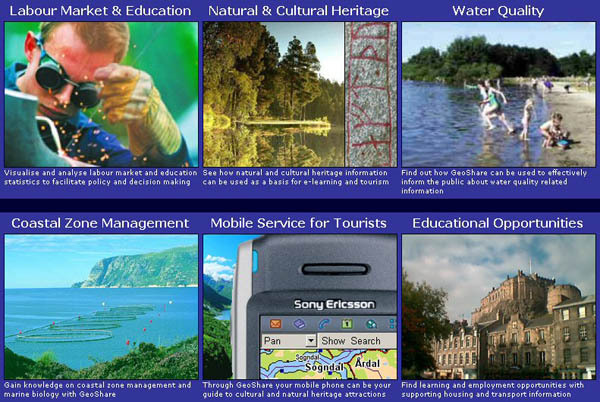 The GeoShare project focussed on the development of a North Sea spatial data infrastructure to be applied within geospatial analysis of labour and education statistics, enhanced spatial management processes and new and innovative services combining natural and cultural heritage based information for tourists. In this perspective the project contributed to international standardisation activities for IT and spatial management. The main achievement of the GeoShare project was the development of the GeoShare knowledge management system for the integration and interpretation of a large set of previously non-integrated systems and services in the four participating regions. GeoShare project developed a complete geo-data infrastructure built on a combination of open source components, custom made integration and middle-ware services and an easily customisable template for developing new end-user services for public sector, citizens and business communities. In-depth information about the various components links to where they can be downloaded and instructions on how to install them can be found on the project website www.geosahre.net. Tangible results have been produced through the provision of a GeoShare framework, toolset and guidelines on how to share information through a GIS based infrastructure. In addition, each region has also implemented additional services, inspired by the other GeoShare regions. For instance, in Edinburgh the GeoShare platform has provided a new service for the introduction of students to the city linked into the portal Share Edinburgh. These modules have also been mainstreamed into the ICT infrastructure of the city council. The project results have been widely disseminated. At regional level the project has influenced and shaped planning policies and guidance. New services are available, and new joint organisational structures between regional public authorities are operational. 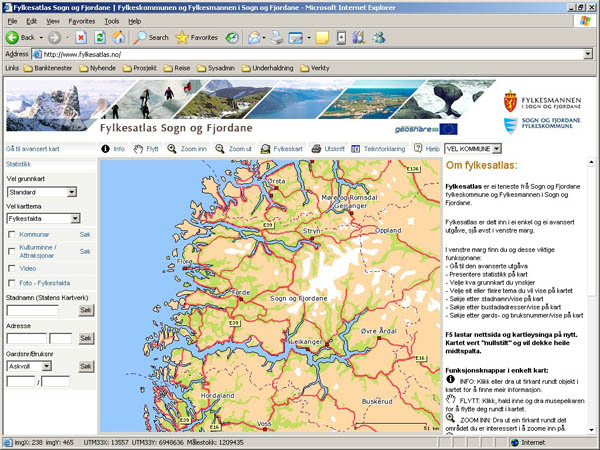 One example is Sogn og Fjordane were two regional public bodies are now sharing ICT platform, infrastructure and public services provision. The project results have been implemented and deployed based on regional political agreements. 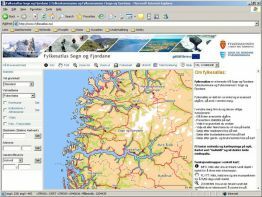 The example from Sogn og Fjordane on joint GIS services is a politically supported model for the new type of collaboration between public sector organisations in the new greater Western Norway region. Similar results are seen in other regions were the operational GeoShare services are the basis for inter-regional collaboration, e.g. Groningen & Drenthe in Netherlands and Bremen & Niedersachsen in Germany. The projects results with regards to the GeoShare tool sets and services have been mainstreamed into operational services in all the regions. The reports, guidelines and procedures have been widely disseminated through the collaboration with other North Sea projects as well as other national and regional projects and projects from other EU programmes. The GeoShare project received many external interest and the new and innovative GeoShare technologies has been implemented beyond the project. GeoShare has contributed to the following programmes and projects by providing information, demonstrations and/or provided services or technology: Interreg IIIB North Sea projects: North Sea Trail, North Sea Cycle Route, Canal Link, River Link, Safety at Sea, Northern Maritime Corridor.